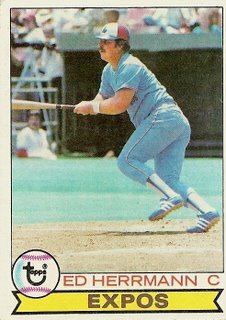 Sad to say, Ed Herrmann hit only one double in his brief tenure with the Expos. That came in the second game of a Bastille Day doubleheader (ah, they just don’t play enough French holiday doubleheaders anymore! ), and so was undoubtedly hit a night. It looks to me as if the photo was taken in the day time, so I’d like to think is that Ed is here watching an up-and-coming rookie secondbaseman (actually there weren’t too many of those in the N.L in 1978, so let’s just call it Dave Lopes) rob him of what would have been a line drive single to right. Boring day at work so I did a little research about Herrmann’s at bat. Thank you retrosheet!. Herrmann played 19 games in his Expos career, all in 1978. He joined the team in June and was released in October so this has to be a regular season game and not a shot taken during spring training. Since he’s in the road blue uniform we can eliminate the 10 home games he played. It’s also pretty obvious that this is a day game played on artificial turf so it has to be from either June 25 in St.L or game 2 of a July 4 double header in PIT. The small shadow at Ed’s feet leads me to believe that this is an early afternoon game. Game 1 on July 4 started at 1:05 PM so game 2 would have started at 4:00 PM or later. Therefore this at bat would have had to have happened late afternoon or early evening. Based on that I’ll eliminate the PIT game and assume it was the June 25 game in St.L. The red sleeve on the guy in the dugout under Ed’s bat seems to back this up. On June 25 Herrmann batted 3 times before being pinch hit for by Gary Carter late in the game. He’s not looking up so this picture probably wasn’t taking during his pop to second in the 4th inning. His other 2 at bats were a single to left in the 3rd and a single to center in the 7th. Ted Simmons was playing left for the Cards and Jerry Morales was in center. Neither was especially fast so I will guess that if a ball had been hit into the gap it would not have been cut off and Herrmann would have reached second on a clean double. It’s kind of hard to tell which one of these hits is pictured, or perhaps it’s a foul ball down the line, but Herrmann only had 5 more hits left in his career after this game so it’s nice to have a record of one of his last days on the field.